Seriously, everyone loves play dough, right? 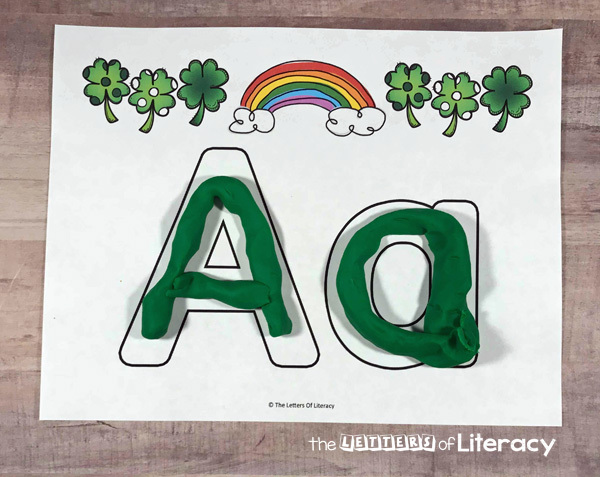 These St. Patrick’s Day Play Dough Alphabet Mats are next in our Printable ABC Play Dough Mat series. Last month we did these adorable hearts & bees that were perfect for Valentine’s Day, and this time around it is super cute clovers and rainbows which are fantastic for St. Patrick’s Day! Not only do the mats help practice kids the alphabet, but play dough has benefits all in itself. When learning can be combined with an inherently fun, hands-on activity I always consider it a win! 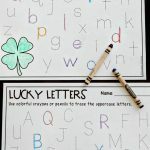 *Combine these with our St. Patrick’s Day Centers for TONS of learning fun! 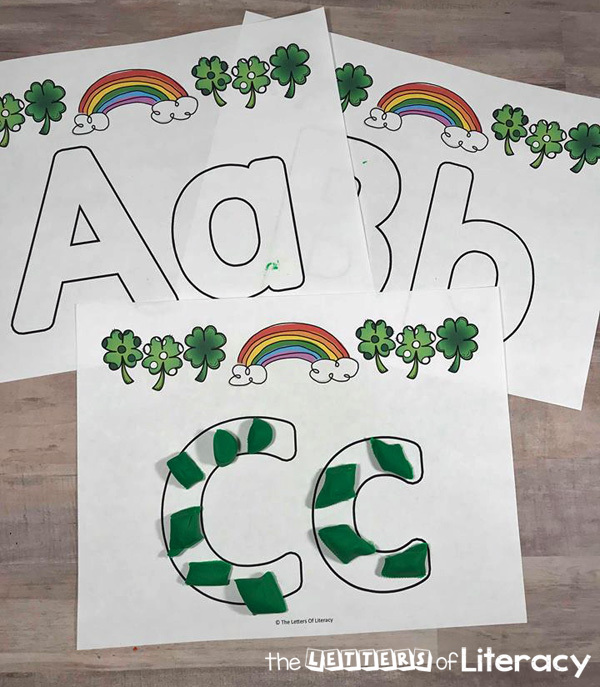 These printables are fun for St. Patrick’s Day and great to help kids practice their ABCs! It is always extra fun to incorporate holidays into the theme of activities. This set is perfect for Preschool, Pre-K, and Kindergarten classrooms! 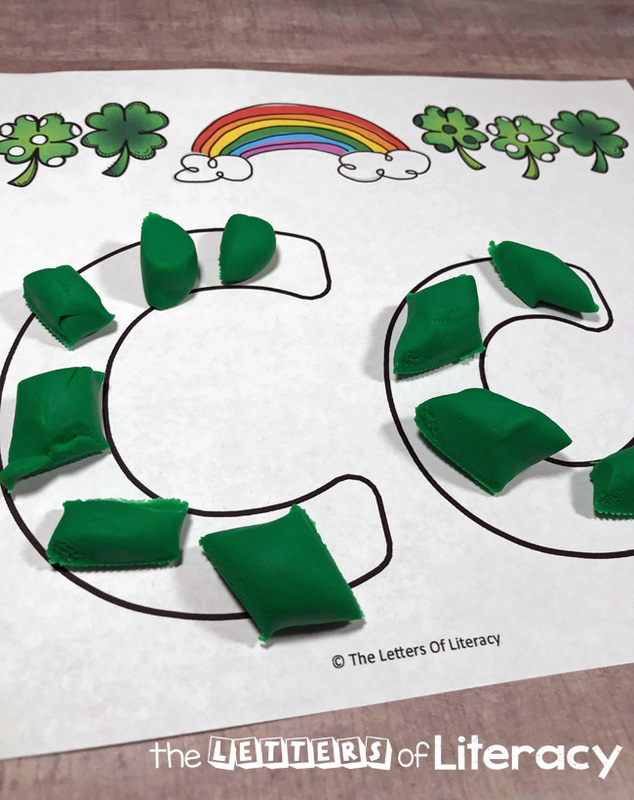 Each one of these full alphabet St. Patrick’s Day play dough mats has an uppercase and lowercase letter. The pack page is 27 pages and includes every letter combination. Each page is also decorated with the clovers and a rainbow. If you haven’t used play dough mats before, you are in for an exciting time! Kids will love exploring with them, and you will be super happy about the fact that once they are ready, there is literally no more prep! What I prefer to do is print out the set and laminate each one. 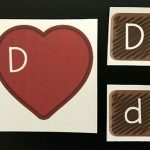 If you are making individual sets for each kid, I have placed two mats, back to back, and laminated them together. 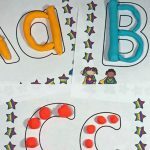 This will depend on how many kids you are creating these sets for and how often each letter will get used at one time. The reason that I laminate the sheets is so that they are easy to clean, as the lamination makes it super easy to wipe the excess play dough off. This also helps preserve the life of the mats. The lamination makes them last almost forever! 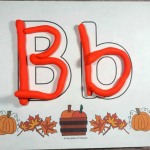 Create a snake with the play dough and use a play dough knife to cut pieces to fill the letters. These play dough mats can also be used with dry erase markers. 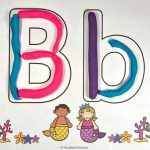 Kids can use markers to create patterns inside the letters (polka dots, stripes, hearts, etc), color each letter in, or use the bubble letter as a template to write the letters. As I mentioned above, it is beneficial to add a factor of fun to learning activities. This helps to encourage children into focusing on the learning activity. There is no shame in that, it is very common! 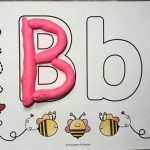 Play dough alone is a fun activity that most children respond well to, so throwing in some letters is an easy transition for both you and the kids! These St. Patrick’s Day Play Dough Mats are full of fun but full of benefits! Play Dough is a fantastic way to strengthen fine motor skills, which makes this a fabulous prewriting activity! Play dough is an excellent activity to encourage the development of hand-eye coordination. Play dough is a fun sensory play activity. Play dough, as well as these play dough mats can increase creativity and imagination. 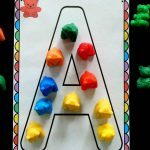 The ABC play dough mats will help with teaching or practicing letter recognition and letter formation. 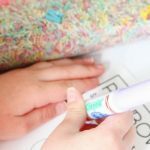 These play dough mats are a wonderful way to encourage children to practice the alphabet in a fun and hands-on way. I am excited to use these as a center activity in the week leading up to St. Patrick’s Day! Ready to play? 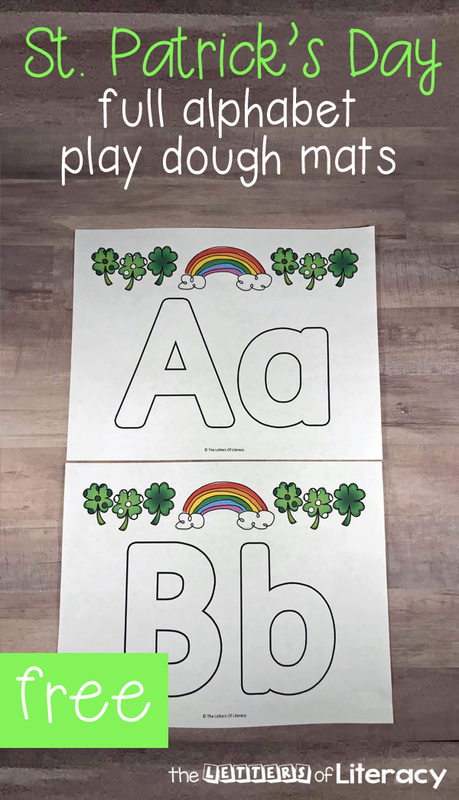 Grab some of your favorite play dough and print your copy of the St. Patrick’s Day Play Dough Mats by clicking the blue button below! 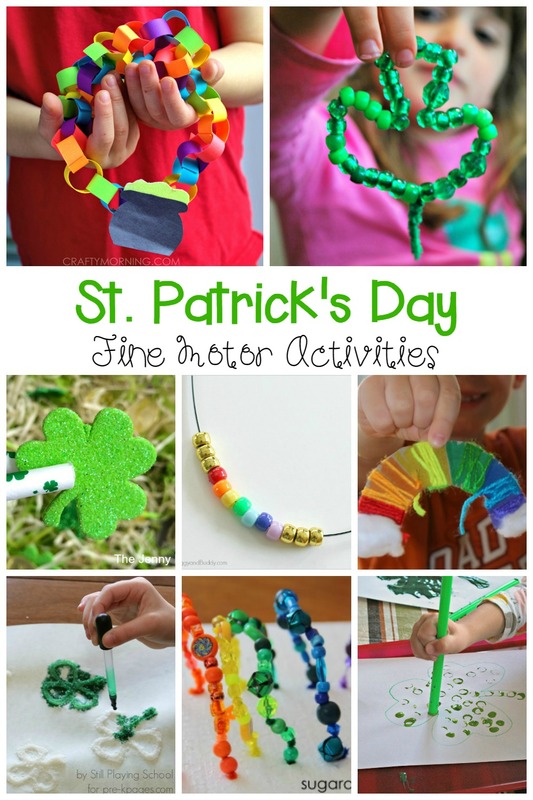 Then, hop over and check out our favorite St. Patrick’s Day Fine Motor Activities! Thanks, Bobbi! That was very sweet of you to say. We are so lucky to get to do the work that we do! Enjoy! Thank you for the St. Patrick’s mats. It is going to be so nice to have such a large selection of mats so my kiddos don’t get tired of the same mat all year long!